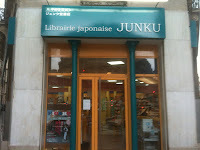 If you are looking for a neat bookstore to visit in Paris, look no further than Junkudo, on rue de Pyramids in the 1st. Yes, everything is in Japanese, but they have beautiful "how to" books on collage that are simple enough to follow by looking at the elegant images in the books. They have agendas, beautiful handmade cards, and some of the most gorgeous origami paper I have ever seen - which of course comes with a hefty price. If you are looking for an unusual gift, this is a go to place. They carry all those neat "Japanese" office supplies to help with organization. They also carry an assortment of bento boxes. The staff speak both English and French, and Japanese, of course. Something for everyone - Happy Shopping!